Alabaster relief with two registers of decoration separated by "standard inscription." 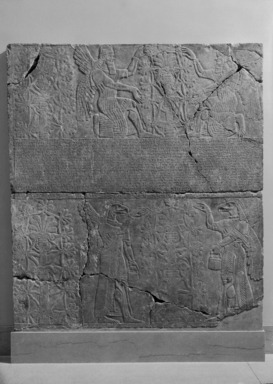 Upper register, two winged, human-headed genie wearing horned caps, kneeling and fertilizing a miniature sacred palm; to the left, another conventionalized palm. Lower register, two standing, winged and bird-headed genie, each with cone and bucket fertilizing a sacred palm; to the left another sacred palm tree. Condition: Cut through center. Both sections now broken into even smaller pieces. Various small gaps, particularly along breaks.